See Mars as it really looks, from the heights of Olympus Mons (nearly 70,000 feet above the surface), to ancient canyons, to Hellas Planitia, the lowest point on Mars, where a meteorite punched a hole in the surface 1,300 miles wide and five miles deep. 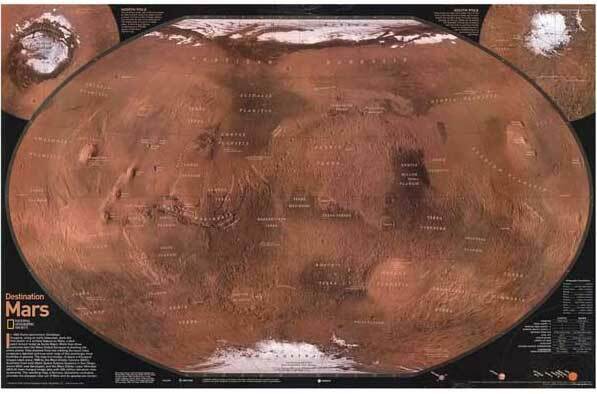 Mars Revealed was created for National Geographic with over 1,000 images taken by the Mars Orbiter Camera, and merged with 330 million elevation points to create the sharpest view yet of Mars and its spectacular terrain. Measures 20" x 31". Two sides. National Geographic’s “The Earth’s Moon” is like having an atlas and almanac in one. 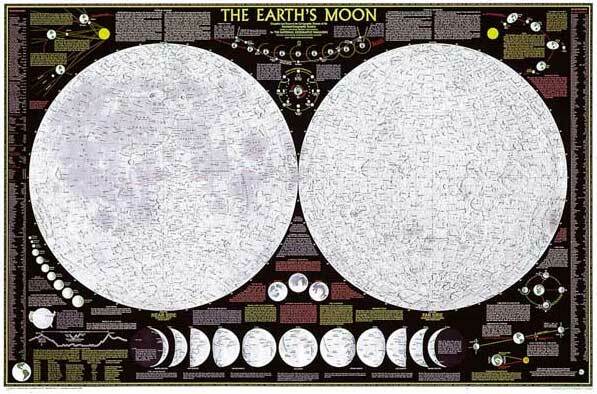 This incredible map/poster shows a detailed image of both sides of the Moon, with an index of hundreds of lunar features. In addition to showing landing spots for lunar missions, the map includes graphics and descriptions of the moon’s phases, its revolution in relation to the Earth and Sun, eclipses, and how the moon affects tides on Earth. There is no better resource that combines imagery and information for the moon.